Google Driverless Car, our Future Transport? Automated cars have been developed by search engine giant Google and are continuosly being tested and developed with the vision on making the world’s roads a safer place for motorists. Apart from preventing traffic accidents or giving more mobility to disabled drivers, these self driving automobiles could give frequent travellers more time to do other tasks while being driven around by, well, a robot! Is this the future of our daily transport? Although we recognise that the motives behind having a car that drives itself are excellent, we can’t help but think that this kind of technology still has a long way to go. Many road traffic accidents are caused by motorists jumping traffic lights in which case drivers often rely on awareness and razor sharp reactions to possibly avoid a collision. Another question is do we yet have enough reliable technology? Computers crash and get hacked all the time. How dangerous it could be if the system had to be rebooted at high speed on a major highway! But these are just a few initial thoughts that come to mind and we know that a huge company like Google would be testing and testing and developing and testing etc for a very long time before they ever got to the point of release and started to market and sell a car that drives itself. 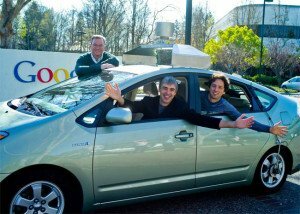 Check out the following videos for more information on the incentive behind the idea of the Google driverless car and also a short clip on what it feels like to be inside this futuristic vehicle. As for us, we love to drive our own precious vehicles. Trusting a machine to do the work and take all the pleasure out of being in control of a car would just scare us to bits and ruin all the fun!